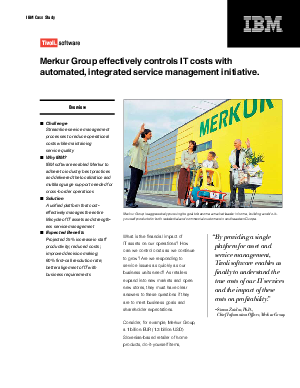 > Research Library > IBM Corporation > Merkur Group effectively controls IT costs with automated, integrated service management initiative. Merkur conducted an extensive selection process for service management solutions, evaluating technologies from IBM, HP, BMC and Computer Associates against more than 120 requirements. Merkur then invited three companies, including IBM, to provide proof-of-concept demonstrations. Following its rigorous review, Merkur selected IBM Tivoli Asset Management for IT and IBM Tivoli Service Desk to automate and integrate IT asset management and incident, problem, change, inventory, SLA and knowledge management processes.